When it comes to workability, boardlife, and sand carrying capacity, nothing is better than a cement-lime mortar. 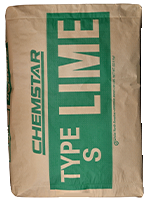 And nothing enhances the quality and productivity of your masonry project like Chemstar Type S Lime. By specifying Chemstar Type S lime, you are providing your customers with the best flexural bond strength and resistance to water penetration available. Prolonged cement hydration for increased boardlife. Improved mortar consistency due to high dispersing properties.